With their grounds separated by just 62 miles, Athletic Club against Real Sociedad is a true, and historic, Basque country derby. In this part of the world, you’re either a ‘red’ or a ‘blue,’ and the intensity of such fervent support is on par with derbies such as the Liverpool and Everton rivalry. San Mames may have undergone something of a makeover in recent years – La Real’s Anoeta Stadium is currently in redevelopment – but the new ‘cathedral’ has lost none of the charm of its predecessor. Or any of the noise which made it such an intimidating place to go for visiting teams. In fact, the acoustics inside Athletic’s relatively new home are quite incredible, the roar when a goal goes in sounding almost animalistic. It really adds something to the enjoyment of the game. No quarter is ever asked or given in these matches, and we can be assured that all 22 players will be doing everything possible to earn the local bragging rights. With Kepa having left for Chelsea, and Athletic’s other custodian Iago Herrerin injured, young Unai Simon, who was fourth choice keeper just a few weeks ago, will be given another chance to enhance his burgeoning reputation. The 21-year-old was excellent against both Barcelona and, particularly, Real Madrid, so coach Eduardo Berizzo would be foolish to can him at this stage. One player sure to miss out though is former Real Sociedad stalwart, Inigo Martinez, controversially signed by Los Leones despite saying in the past that he would never play for Athletic. A leg injury that he suffered last weekend against Barcelona rules him out, taking some sting out of the battle ahead. Athletic have only won one of the last five against La Real at San Mames, but have only lost one too. Since 2004 in La Liga, the balance is pretty equal; Eight wins for Athletic, seven for Sociedad and eight draws. There’s also a real synergy between the two teams at present. Sociedad find themselves in 13th with Athletic in 15th, separated by just one point. Both teams have scored 10 goals this season, La Real with a -1 goal difference, and Athletic with -2. This weekend’s hosts have not won since the opening day against Leganes, but have held Real Madrid at home and Barcelona away, both 1-1 draws. The latter result stopped the rot of 14 successive defeats at the Camp Nou. Real Sociedad lost the other Basque derby that they’ve played in 2018/19 to Eibar and have only one other win since a surprising opening day victory over Villarreal - and that was against second-bottom Huesca. Athletic haven’t won in five matches, and Sociedad have just the single win in the last six. Three of the last five meetings have ended in draws, and two of those were 1-1. Given current form, both teams to score in another draw isn’t a bad bet by any means, and Bet365 have that at decent odds of 15/4. There won’t be an empty seat in the house, and with the match being played on Friday night, Bilbao will be awash with noise and colour once the game is over. Athletic tend to start better at home and an early goal certainly isn’t beyond them, particularly if the crowd are right behind them. 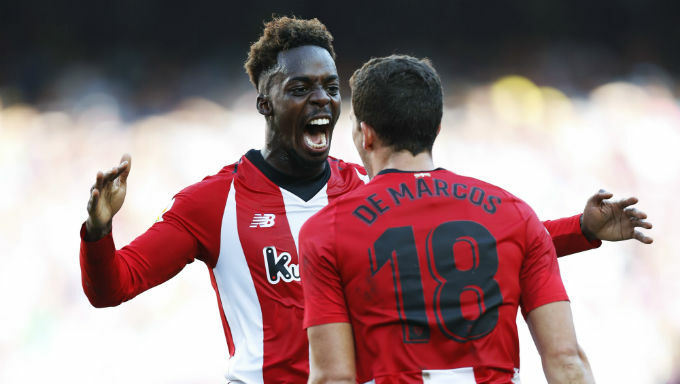 Inaki Williams or Markel Susaeta can get beyond the full-backs, as the former did with relative ease against Barcelona, and a 4-2-3-1 formation from the hosts gives them a good presence across the line when going forward. With Kevin Rodrigues so keen to push up for Sociedad, Oscar de Marcos could also get some joy for Athletic down the right-side. A half-time/full-time bet of Athletic Club/Draw with Ladbrokes is a healthy 14/1 and is worth a flutter. There’s no doubt that both teams have decent firepower up front, but neither front line has really got going so far this season. In a number of matches they’ve flattered to deceive, and that will be a disappointment for players, manager, board and supporters alike. At the beginning of the campaign, they would’ve set their stall out for a tilt at the European places, and that’s really where clubs of their size deserve to be. However, you need to earn the right and, frankly, that’s not happening at the moment. Though a draw isn’t the best result for either side, neither is it the worst given the opposition and sense of occasion. With the spoils shared – again – a correct score bet of 1-1 with 888Sport looks worthwhile at 21/4.